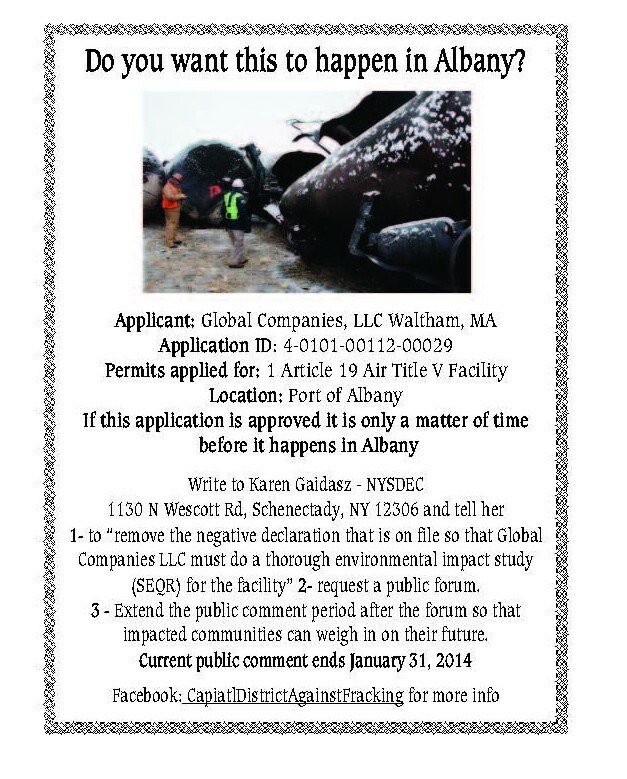 Note: This post is a follow up to Grace Nichols’ post yesterday, “Environmental Defense.” As promised, we will share links and resource information on the Albany Port issues. 1. A public forum that will educate the public about the Global Companies, LLC project proposed for the Port of Albany and provide detailed public health and safety information. 2. An Environmental Justice assessment be conducted and made available to the public. 3. The public comment period remain open for at least one month after both the public forum is held and after the Environmental Justice assessment is made available to the public. What was most interesting about the Common Council meeting was the public comment period. I knew little about this issue before 14 or so folks stood up and said their piece about the risks of both what is currently already happening at the Port of Albany (see this link for a little background: http://www.capitalnewyork.com/article/albany/2013/12/8536773/crude-awakening) and what is being proposed. “There is a DEC public comment period for the new boiler facility proposal–We have until January 31st to express our concerns. One thing is certain, we need to be vigilant, stay informed, demand information and act where necessary. Let us know what you think. This entry was posted in Activism, Political Education. Bookmark the permalink.